Do you remember the first artwork that resonated with you? Did you see it in person or as a reproduction? I wasn’t exposed to too much art growing up; what I did see, I came across in print and online. I do remember finding Matisse’s cut-outs early on in a book. At the time, I was drawn not only to the playfulness of the compositions, how unpretentious and organic the forms were, but also to the fact that even as his faculties deteriorated, he was able to find new ways of translating longstanding ideas. It was only years later, after I’d moved to New York, that I saw the work in person, which was a total revelation. As reproductions, those pieces are so flat, almost purely graphic – but up close, you see how handmade they are, how casual he was in his layering and application. It wasn’t precious at all, not nearly as precise as they seemed in photos. That definitely stayed with me: the idea that works could function in both modes, could give different but equally useful kinds of information depending on how they’re encountered. That’s actually a great point of reference, because it seems like with these latest exhibitions, you’ve been making real efforts to straddle that line. On one level, the work is primed for circulation – there’s an obvious investment in the way they photograph. For sure. With the documentation photography, I’m hoping to convey a sense of the rhythm of an exhibition. It can't replace the immediate, in-person experience, obviously, but the photographs do become an extension of the work, in the sense that I’m not documenting a static individual piece, but rather a rich and complex environment. It’s a suggested reading, if you will, that is in no way meant or able to replace a personal experience, but still serves its own function. Right. It's a different experience to see these things up close—the work definitely rewards a more intimate reading. I'm always surprised by the amount of variation at work, the incidence one finds in the canvases’ surfaces. That doesn’t necessarily translate in images; it’s really only evident when seen upfront, from feet away. Oh, absolutely. I think those elements are really important. In my work, I’ve always tried to ensure that each part of the process is accounted for: everything is acknowledged and allowed to remain present. 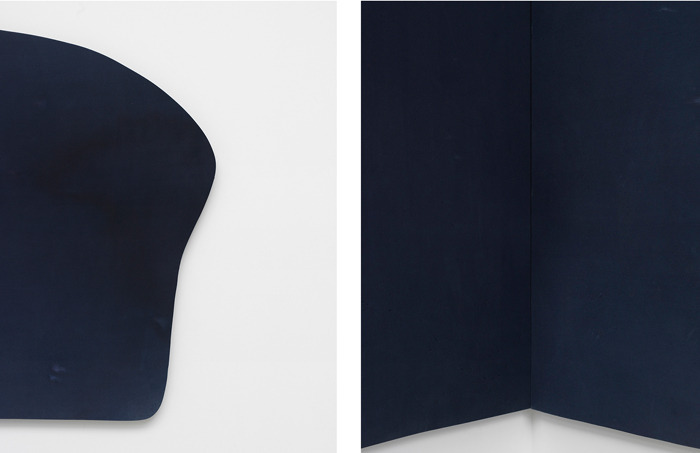 So with these works, the way that the dye and canvas merge with one another is very revealing. It reaffirms the process. There's a physicality to it, of course – the gesture, the literal evidence of my hand – but it ultimately says more about the materials than it does about me. So really, to remove those physical traces would not only be unfeasible technically, but would also go against the principles of my practice. It matters that the materials are self-mixed and manually applied. It definitely wouldn’t be the same were they done in industrial blue with a uniform surface. It’d be an entirely different statement. Nothing in my practice is about removal, revision, or covering up. It’s about finding value in what’s naturally there. That’s as true in viewing the work as it is in producing it. I’m interested in stripping away peoples’ expectations, the hierarchies involved in experiencing art. But this is something that has to happen in real time; consequently, the work ends up falling somewhere between painting, sculpture, and performance. If it does become a matter of performance, who or what is performing? You? The works? The viewers? I think both, acting in concert. In that sense, maybe it’s more about choreography than simple performance. Maybe in this scenario I’m the choreographer, albeit one with limited influence. The paintings are suggestions for positions to occupy within a space, for steps to be taken. But it’s not about dictating the routines. I’m simply providing the viewer with a framework, an opportunity to be mindful of the experience, to acknowledge his or her body and its relationship to the work and setting via time and proximity. What that means to each viewer, though, is beyond my control, since the realized work is ultimately left up to all these other variables. Wayne Koestenbaum once characterized Barthes' project as one of “rescuing nuance” – which he defined as, among other things, a willingness to be enamored with detail; a denial of mythologies; an allowance for multiple views to co-exist without resolution; and the embracement of ambiguity over prescription. To me, these ideas seem very much in keeping with your recent works. Absolutely. That really goes to the heart of it. I think so too. But reading that essay, I also considered the role of patience—or, more to the point, the audience's willingness to be patient—in that equation. Which is to say: If we are indeed living in an “attention economy,” it seems counterintuitive to be making work that requires such fixed, extended mindfulness from viewers. Right. For me, excitement, gratification, insight – all of these things come from investment, from active engagement. My work’s always been about appreciating the inherent properties of each constituent in the process. Nothing is discouraged at all; every gesture is laid bare. In my mind, it’s about being democratic in every way possible. Everything can be allowed a sense of authorship and serve a function. But you can only accomplish that by acknowledging what is already there and working with rather than around it. With the earlier dye paintings, the process was shaped by a certain allowance for spontaneity: accommodating the natural tendencies of the dyes, offsetting intention with environmental influence, and so on. 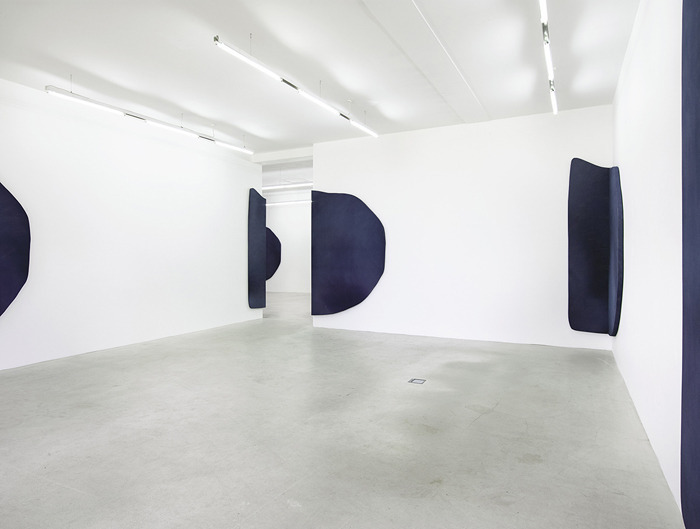 This new work is far more exacting on that level – the very nature of their design, the precision required to produce and install them, would seem to curb that element of chance to some extent. That’s true in a way, but the element of surprise is definitely still there – it has less to do with my execution than the audience’s reception. I’m still interested in making things less predictable, relinquishing control. It’s just that before, the drama unfolded on a self-contained canvas; now, it unfolds in a broader physical space. Along those lines: I know we’ve both spent time with those conversations between Duchamp and Calvin Tompkins. I remember Duchamp at one point defining chance as a means of escaping what’s already been worked out – which is probably obvious enough, and which I certainly think applies to your work. But later, he also suggests that chance might express what is “unique and indeterminate about us beyond the rational” – the implication being that in embracing chance, we might relinquish intention, but never ownership. Even in inviting randomness, we reinforce our own presence in the work. I think that’s exactly right. The artist is always present, no matter how subtle her or his role becomes. What’s been interesting to me recently is to negotiate those levels of subtlety, to explore the other elements involved in the process beside my own associations. Speaking of subtlety: In looking around your studio, one can’t help but be impressed by the frames you’re building for these installation pieces. They’re really strange and singular in their own right, but it becomes apparent very quickly how precise they are, the meticulousness involved. For the installations to be effective, the frames have to be planned and built exactly to spec – which can sometimes be a challenge. 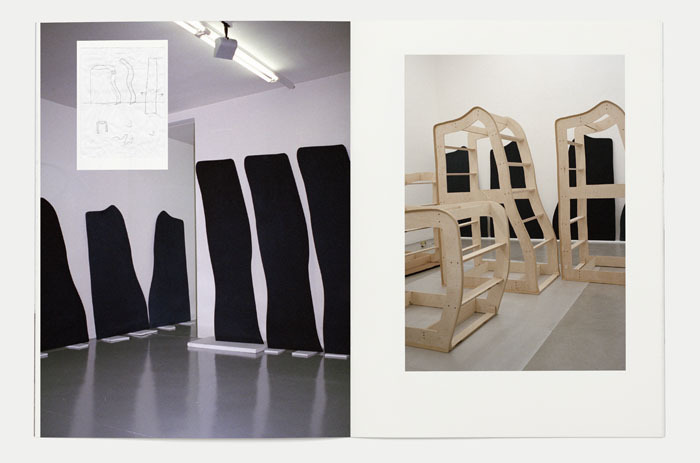 With the Andersen’s show in Copenhagen, for example, the space was laid out so that every piece could wrap the corners in the same way except for one section, which happened to connect the two spaces of the gallery. In order to work with that part of the architecture, I ended up having to construct the frame with an entirely different angle. The effect is the same, so it’s probably easy to overlook, but the process of achieving that result was demanding. It’s fine, though, because it’s ultimately those complications, those idiosyncrasies in the space, that allow for variable readings. That’s really the point: the installs should reinforce what’s unique about each setting. I don’t impose the work onto the spaces. I try to activate what’s already there. 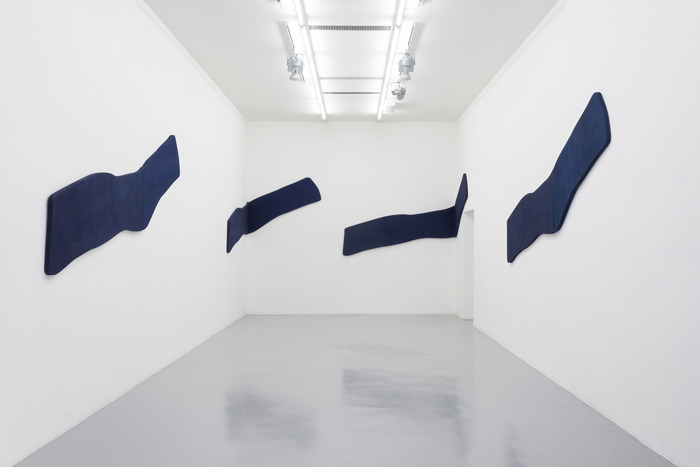 That might explain why unlike the Fuentes show, where the canvases were uniform and met at each corner, the installation at Andersen’s featured more stand-alone pieces, more fragmented forms. Exactly. Each strategy was a direct response the environment. With Andersen’s, some of the works seem to lack partners – one piece stops in the first room and appears to continue in the second. But what ends up happening is that it becomes possible to connect multiple forms in the space, depending on your vantage point. For example, if you look at the doorway straight on, you don't see the separation, so the two forms appear to connect. If you move towards the corner of the room, other formations appear. You gradually start losing the narrative, how the show’s “supposed” to be read; it becomes more about your relative position. That's one thing about this exhibition that wasn't possible at Fuentes, and it’s simply because the space itself is more complex. It provided a lot more opportunity to show how the work truly functions. It’s interesting, because one typically thinks of galleries as these purposefully neutral spaces – the White Cube, and so on. But with this work, you’re tasked with finding what makes each space unique, drawing out its personality. Totally. Even in the most seemingly plain environment, there’s a lot of information to work with. Then you factor in the viewer, the way people respond in their own way to each setting, and things become even more complex. There are different levels, different forms of attention that one can pay to his or her surroundings, and that’s something I’m interested in addressing. For instance: I think one of the most interesting aspects of the Andersen’s space is that it's bisected into two rooms with very different environments. One has windows and one doesn't; one has a wood-burning stove, the other is bare; one is small and intimate, while the other is very elongated and takes much more time to navigate. These things have a huge effect on how one reads the show. With the smaller room, it hits you quickly, and you feel surrounded by the work, immersed in it. The larger room is more expansive and has a slower rhythm, which invites a longer reading. 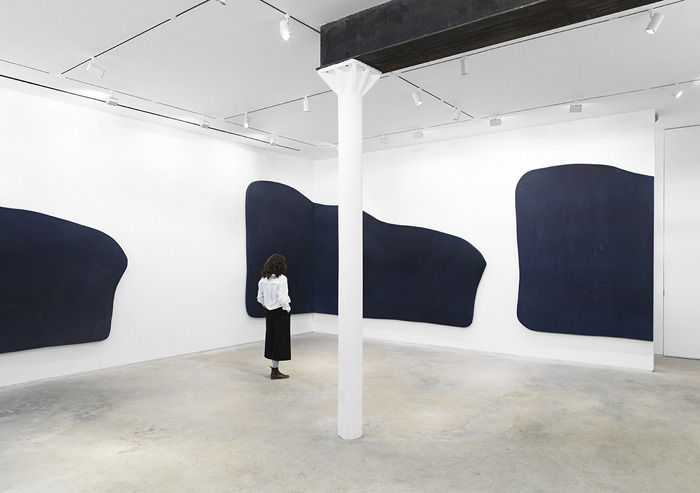 Those are very different responses to what’s essentially the same work, and you quickly realize that it’s the space itself that’s responsible for it. It forces an awareness of the environment – and, as a byproduct, of oneself. But that brings up what I think is a crucial distinction, which is that you don’t consider these works to be site-specific. That’s true. They respond to spaces in a very direct way – they reflect, accommodate and activate them – but they’re not dependent upon them. They’re meant to be transferrable. The same works applied to a different space would only accentuate further the subtleties unique to that place, continuing to shift the value from the object to the experience. You know, in discussing your work with others, I’ve been asked on numerous occasions whether you were gradually transitioning from painting to sculpture. I just say that a broadening conversation requires a similarly broadening vocabulary. That’s a great answer. I myself would say no, simply because I don’t think either label really applies. I think it’d be more accurate to say that this work is very much about the relationship between object and the image, the way one dictates the other. With the serial paintings, the image bleeds off the canvas in such a way that it’s only really manifested through a meeting of multiple objects. It’s the same thing with these recent installations, where the fractured elements are pieced together visually rather than physically. Both modes use material seriality to allude to the realized form. I myself never present the completed image – it’s something that occurs entirely in the viewer’s perception. This happens in the new video work as well, only now it’s even more subconscious, as your mind pieces the forms together in an attempt to compensate for the speed of the frames. Once again, you’re asking where the line between actual and automated perception lies. Exactly. In the Fuentes show, one approached the works as singular, even though each was clearly composed of two separate canvases. At Andersen’s, depending on your position, one could perceive forms in different rooms as completed images. And now, with the video, it’s not even a matter of willing things into coherence: it’s automatic, a perceptive reflex. So part of what I like about the video work is that it’s using the individual in service of the whole. The value of the single painting is compromised as it bleeds into the mechanism. The painting is being used. But I also like that you’re not viewing the work as a mere result, shown after the fact of its completion – here, the work is being generated in real time and requires your presence; ones physical relationship to the piece actually changes the work. But then, all of this is just as true with the shaped canvas installations and the serial paintings. So you don’t see the incorporation of video as a departure. I don’t, which is definitely an important point. With this new work, I’m really hoping to show that I don’t have an investment in any single medium. Whether its painting, sculpture, video or whatever else, I’m using each medium as a material, adopting a pre-existing vocabulary to my own ends. What I communicate through these vocabularies may reflect their relative histories, but it’s in no way bound to them. My impulse at this point is to complicate things, to explore different avenues, to translate. The more I’ve done so, the more I’ve found that increasing the variables only adds clarity to the constants. Does it degrade the works to think of them in terms of painting, of sculpture? I don’t think it degrades them; I just don’t think it’s necessary. The finished pieces end up falling somewhere between any number of formats, and they’re meant to accommodate subjective readings – including those based in more rigid notions of medium. I think the work can lend itself to those kind of discussions if one insists. But at this point, my interests lay somewhere beyond that. In the end, people need entry points, ways of understanding the work for themselves. Our minds want to categorize, to compartmentalize – it’s how we’ve learned make sense of things. Taking that into consideration, people can call the work whatever they need to. Regardless of how they get there, I’m confident that it can offer the engaged viewer a meaningful experience. As ever, it’s a matter of allowance. That’s right. As I said earlier, it comes down to acknowledging the state of things without feeling the need to revise them. That’s really the underlying philosophy, and it applies to everything from my use of materials to my handling of space. It’s about the moment, which is unfolding and undefined. The aim is to establish a mindset in which that’s acceptable, in which nothing is negligible, all matters equally. I remember you saying these same things to me a few years ago as you began working with dyes. Well, that’s really the anchoring of my practice: this idea that one finds new territories not by uprooting, but by digging deeper. All of the work is essentially pointing to the same things, just doing so from different angles. And because it’s coming from the same place, the work really informs itself. With each shift, the larger conversation is only strengthened; the more dense things become, the easier it is to understand what’s happening. As with anything else, it comes down to denying the need to resolve things. Once you’ve done that, you’ve found a source of continuing vitality, of constant renewal. 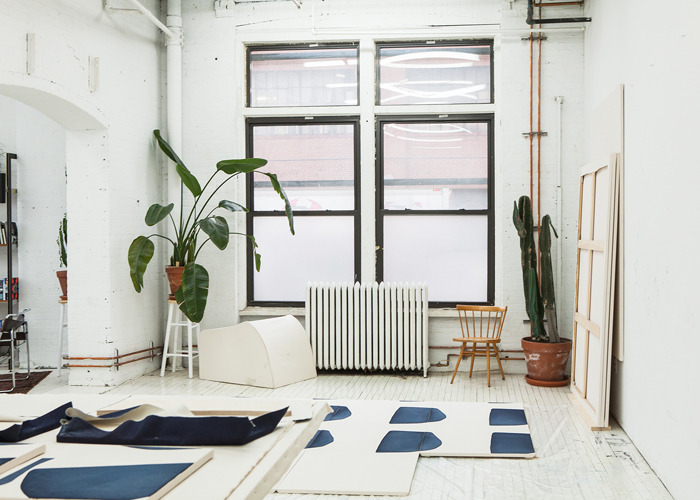 Conversation held at the artist’s studio, New York City, June 2015.